After tragically losing the use of his legs, Bran Stark enlists the service of Hodor to avoid being bedridden. The Game of Thrones Hodor and Bran Figure displays this duo as they are portrayed in the Game of Thrones series. Hodor is a simple but friendly man from Winterfell who is towering in stature and has the strength to match. In this figurine, he is shown wearing a custom harness which Bran is strapped to, allowing Hodor to retain the use of his arms and for Bran to be carried in an upright position. Each character is incredibly detailed in their depiction and is shown wearing the same attire which they wear in the HBO show. 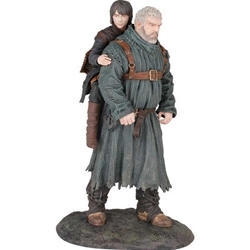 Display your support for this limited Lordling and simple giant with the Game of Thrones Hodor and Bran Figure.